on 1863 QV 6d blue-green CC wmk (SG.65), straight edge at left. on QV 4d rose Crown CC wmk (SG.62), slightly aged, rare on this issue. 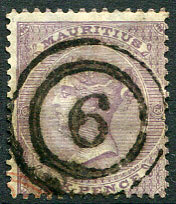 on 1863 QV 6d dull violet Crown CC wmk (SG.63), tiny tear top right corner. 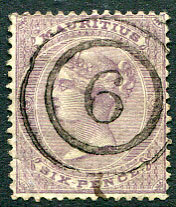 on 1863 QV 6d dull violet Crown CC wmk (SG.63). on 1872 QV 1d bistre CC wmk (SG.57), full perfs. 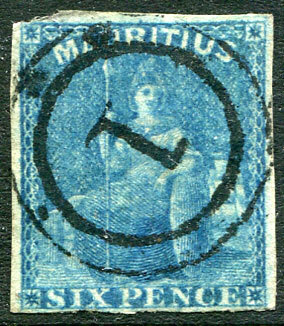 on 1859 Britannia 6d blue (SG.32), mainly clear four margins, design just touched top left corner. on 1863 QV 6d blue-green CC wmk (SG.65), blunt corner perf. on 1860 QV 2d blue No watermark (SG.47, Cat.£55), blemishes and two horiz. creases. 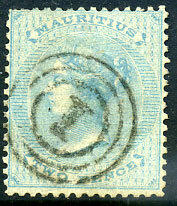 on 1863 QV 2d pale blue Crown CC wmk (SG.59). 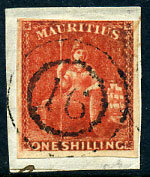 on 1879 4c orange CC wmk (SG.93). on 1883 QV 4c orange CA wmk (SG.104). on 1863 QV 1d brown CC wmk (SG.57), perf. fault. 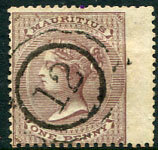 on 1863 QV 1d brown CC wmk (SG.57). on 1863 QV 6d dull violet CC wmk (SG.63). 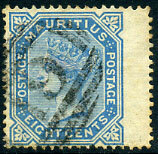 on 1863 QV 2d pale blue Crown CC INVERTED wmk (SG.59w). 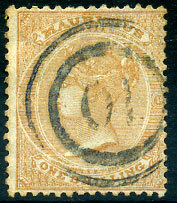 on 1863 4d rose Crown CC wmk (SG.62), pale colour. on 1863 QV 6d blue-green CC wmk (SG.65). on 1860 QV 2d blue No wmk (SG.47, Cat.£55). on 1886 2 CENTS on QV 38c bright purple (SG.116, Cat.£45), some facial faults. on 1863 QV 1d brown Crown CC INVERTED wmk (SG.57w). 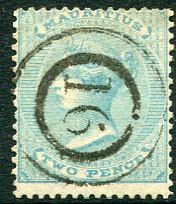 on 1863 QV 2d pale blue CC wmk (SG.59). on 1863 QV 1/- green No wmk (SG.53, Cat.£200). on horiz. 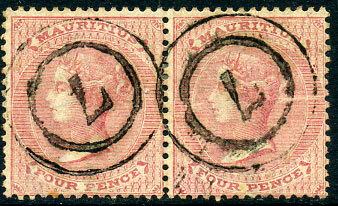 pair 1863 QV 4d rose CC wmk (SG.62). 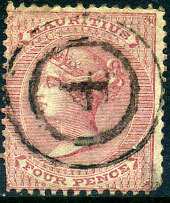 on 1863 QV 4d rose CC wmk (SG.62), both lower corners defective. on 1863-72 QV 4d rose CC wmk (SG.62). on 1862 QV 1/- buff No wmk (SG.52). in two concentric circles on 1859 1/- vermilion (SG.34) piece, 3 clear margins. on QV 4c orange CA wmk (SG.104). on QV 2c dull rose CC wmk (SG.83). on QV 8c on 2d blue (SG.85). on QV 4c carmine CA wmk (SG.105). on QV 8c blue CC wmk (SG.94). on QV 16c on 17c rose (SG.115). on QV 16c chestnut CA wmk (SG.109). on QV 4c orange CC wmk (SG.93). on QV 2c Venetian red CA wmk (SG.102), some clipped perfs. on QV 2c green CA wmk (SG.103). 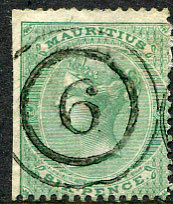 on QV 50c on 1/- green (SG.90). on QV 16c on 17c rose (SG.115), toning. on QV 25c olive-yellow CA wmk (SG.110). on QV 4c orange CC wmk (SG.93), perf. fault.